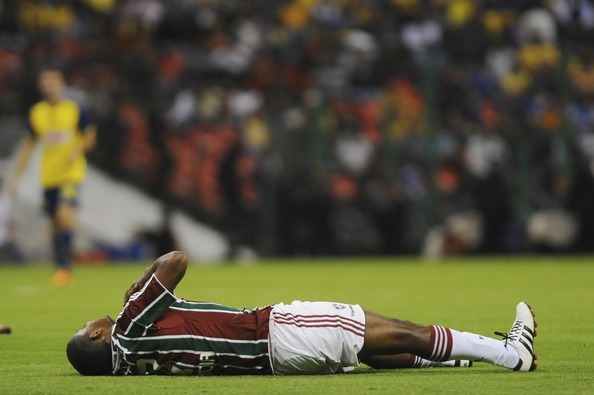 Fluminense and Santos both had disappointing results in the Copa Libertadores last night. Fluminense slipped to a 1-0 defeat against América in Mexico City while Santos conceded a last minute penalty and drew 1-1 with Cerro Porteño at home. Cruzeiro drew 0-0 with Deportes Tolima in Colombia. After drawing their first two matches at home, Fluminense had it all to do in a high pressure match in the giant Aztec stadium. They were still without their talisman Fred as well as well as the slightly less talismatic but important Deco, Emerson and Rodriguinho (all injured). At an altitude of over 2000 meters, América were tested Fluminense keeper Ricardo Berna with long range shots at every opportunity. For the most part Berna defended his goal well. Fluminense huffed and puffed and and were aggressive in the tackle but ultimately without key forward players and an out-of-sorts Conca, they couldn’t find a goal and their Libertadores hopes now hang in the balance. Santos are in a slightly more comfortable position although the pressure is mounting on them and they shot themselves in the foot last night. They failed to finish off their Paraguayan opponents who boasted new Argentine sensation Iturbe in their ranks. Iturbe was a menace but Santos had chances to get a second goal which they didn’t take. Their achilles heel of poor defending popped up once again and they conceded a silly penalty at the worst possible time. Main striker Diogo was once again out of sorts and I really don’t think he cuts it. The pressure is building for Santos who are without a coach and are banking on a good Libertadores run to keep hold of their star players Neymar and Ganso. Cruzeiro will be happy with their point away from home and another clean sheet. Their excellent goalkeeper Fábio saved a penalty for them. Cruzeiro now have seven points from three games and haven’t conceded a goal in the competition so far. Grêmio host the little known León de Huánuco from Peru in a key tie in their group on Thursday night. Internacional don’t have a match in the Libertadores this week and face the interestingly named team Jorge Wilsterman in two weeks time. This entry was posted in Libertadores and tagged América Mexico, Aztec stadium, Conca, Copa Libertadores, Cruzeiro, Fábio, Fluminense, Santos by Brian Davidson. Bookmark the permalink.